Leading the charge with three golds was Ellie Loesch. The senior sprinted down the track in the 100-meter dash in 12.96 for the crown and later added the 200-meter dash gold in 27.42. At the end of the night, Loesch joined forces with Ashley Kriener, Becca Wagner and Shira Hageman for gold in the 4x100, producing a combined time of 54.38. Emmaleigh Ohrt sailed the discus 99 feet, 3 inches for her gold medal. Two bronzes were also had by South Winn as Ashley Kriener raced around the track in the 800-meter run in 2:41.30. Olivia Massman, Mary Conway, Kayley Taylor and Melissa Ward earned the Warriors’ other third-place finish in the distance medley in 5:02.95. 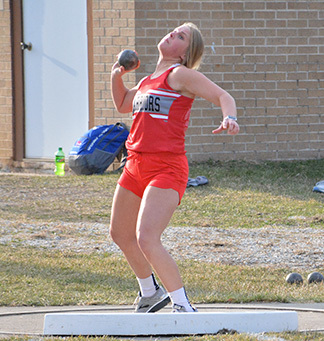 The Lady Warriors are scheduled to compete at the Decorah meet Thursday, April 11, at 5 p.m. before making the long trek to Hudson Monday, April 15, at 4:30 p.m.